I’ve always been fascinated at the reasons for people doing the jobs they do. Some of us pursue childhood dreams, but others follow a winding path that takes us somewhere quite unexpected. Perhaps it was a summer job we never left or an unexpected opportunity that sounded too good to pass by. I’m London-born and bred, and from the tender age of seven I only ever wanted to work in the great outdoors. Agriculture and horticulture were great interests of mine, and they’ve never left me. It wasn’t a straight path to shepherding, I dabbled in other roles – butchery, wine-waiting and retailing to name a few – but my passion for fresh air and love of a challenge meant shepherding and I soon found each other. So many people assume shepherding is one-dimensional; it’s just about the sheep. But that couldn’t be further from the truth. One of the things I love most about my job is its unpredictability, and that’s something I hear from people everywhere, no matter what their profession. Unpredictability keeps us fresh, alert and stops us falling into a rut. For me, the unpredictability of the British weather and the need to be able to interpret the behaviour of my sheep means shepherding has far more in common with other management roles than might at first be apparent. After all, I spend my time caring for and ensuring the good health of my charges. I also need to look after and understand my dog! So instead of having just the one focus and variable, there are a huge number of potential situations I can find myself in. It’s fair to say no two days are ever the same! We stay sharp: Variations in circumstance help keep us on our toes. If our job is the same day in, day out, we lose interest. Moving my sheep to a new field gives them a new lease of life just as alterations in our daily routine give us interest and a new perspective. We broaden our knowledge: A shepherd isn’t just a sheep specialist. He or she is also an expert in dogs, in weather, in nutrition and technology. In much the same way as a teacher isn’t just a specialist in their chosen subject, they’re also experts in childhood behaviour and communication. The broader our knowledge, the more effective we can be. We learn to be more adaptable: I have to treat my flock and my dog differently – they have different needs and do different things. My dog is a helper, but cannot work alone – if I treated all my animals in the same way and neglected to respect their differences, I’d have trouble on my hands! Working in different situations or with different people means we need to adapt our personal style for success. Sometimes you may learn something new from these adapted behaviours! 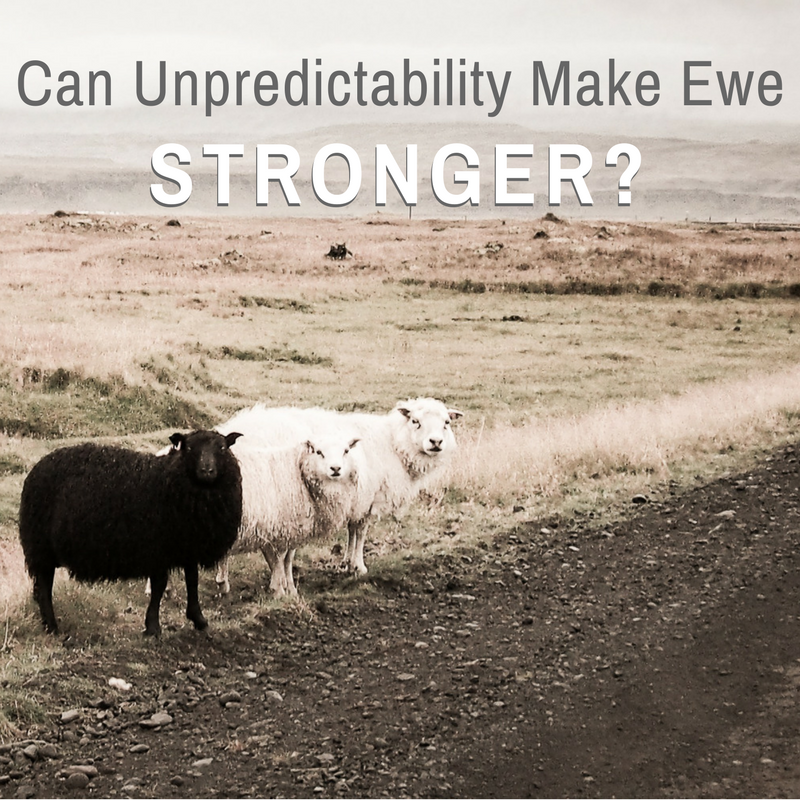 The unpredictability of shepherding means I regularly need to consider problems from more than one angle, and this is something everyone can benefit from. Sitting in a different chair to normal, listening to a different radio station or podcast on your daily commute or checking your facts with a different source can give you a new perspective or an alternative, sometimes better, result. As another year ends, most workplace teams look forward to a well-deserved celebration. Are you going for the usual roast turkey meal in a pub or for something more unpredictable? And if not, why not? Share your comments in the space below or Tweet us @RaisingTheBaa. We’re looking forward to hearing from ewe!